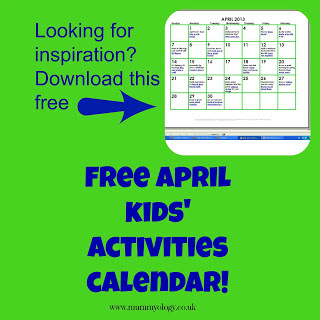 Free April Kids’ Activity Calendar! Since today is so close to the end of March, I’m trying something a little different for today’s post. I’ve made a free activity calendar for you to download for April, with loads of ideas for stories and activities that you can click on directly to get to. I hope you like it! 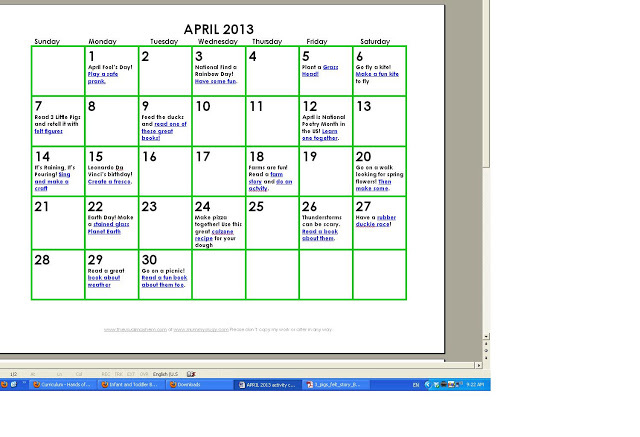 Just click on this link to go directly to the printable April activity calendar. I’d love some feedback; if it helps people out, I’d be happy to do one every month. I’m also linking up with Peek at My Week on Mrs. Wills Kindergarten. The easiest last-minute Mother’s Day craft ever! Dragons for St. George’s Day! This looks amazing!!! My boys are 3 & 4 and this will be right up their alley for sure. Thanks for the inspiration for the coming month. I look forward to doing these activities, as well as possible future calendars. Love this! And I love that it’s not everyday! Please keep them coming! Lots of cute activities for April! Love the one about growing a grass head! I teach a child development class to high school students and we do a child care lab simulation for one month – this will be very useful in helping them to plan their activities – thanks for the work and idea. A monthly calendar would be great!